Blog: Mental health and physical activity in Northern Ireland. Mental Health Foundation. Most people know that engaging in physical activity is not only important for our physical health, but also for our mental wellbeing. Much of the existing research focuses on the impact of physical activity on depression, with multiple studies finding that physical activity is associated with a reduction in depressive symptoms. The Royal College of Psychiatrists states that a moderate level of exercise can be as good as antidepressants or cognitive behavioural therapy (CBT). The relationship between physical activity and mental health appears to work both ways1, with increased physical activity resulting in better mental health and vice versa. Not surprisingly, then, those with severe mental health problems are less likely to engage in physical activity and are more likely to be physically unwell. The evidence for the positive effects of exercise on a range of mental health problems is growing, with studies demonstrating that exercise can improve the lives of people with schizophrenia2. Despite this, exercise interventions are often neglected in mental health care3 and the mortality gap for people with serious mental health problems continues to widen. This is particularly pernicious in Northern Ireland, a country in which the recent political turmoil has exacerbated the mental health crisis to catastrophic proportions. The Mental Health Foundation, along with several partners, including Queen’s University Belfast and three Recovery Colleges (Northern Recovery College, South Eastern Recovery College and Western Recovery College), has received funding from DRILL (Disability Research on Independent Living & Learning) to conduct a one-year pilot study to address the high levels of physical ill-health and preventable deaths of people with serious mental health problems in Northern Ireland. Co-production will inform the entire study. Individuals with lived experience of psychosocial difficulties will receive accredited training from Queen’s University Belfast to become peer-researchers on this study. They will then have an instrumental role in co-producing the programme design, research methodology, analysis, research findings recommendations and promotion. The physical exercise programme, targeted to people with a range of serious mental health problems, will be developed from a series of co-production workshops with people with lived experience, and consultations with recovery colleges, sports organisations and health professionals. Participants will undergo tailored health checks to determine the programme’s impact on participants’ physical and mental health measures. The sustainability of the programme will be explored via interviews and consultations with partners, and recommendations and next steps will be identified. The shocking fact that more people in Northern Ireland have died by suicide in the past 18 years than were killed during 30 years of conflict highlights the urgency of the situation. Mental health problems can no longer be ignored, and innovative, creative approaches and solutions should be explored. This is exactly what we seek to do with our partners through this large-scale physical exercise programme designed to empower people with serious mental health problems to incorporate physical activity into their lives. Not only does this innovative study seek to develop the evidence base for physical exercise interventions in mental health, it also hopes to provide practical solutions that will improve the delivery of services in Northern Ireland. Health and social care services are failing disabled parents and their children, a report published today suggests. Disabled parents told the report’s authors that health and adult social care professionals assessing their needs often ignore the parenting implications of their impairment and fail to communicate with their counterparts in children’s services. Meanwhile, children’s social care professionals too often see the parents’ impairment as a potential risk to their children and prioritise monitoring over meaningful parenting support that would keep families together and avoid crisis interventions. Disabled people are therefore too anxious to seek support for fear they will be seen as failing. The research was undertaken by the Tilda Goldberg Centre for Social Work & Social Care at the University of Bedfordshire and Ginger Giraffe, an organisation that brings together disabled people with health and social care students on placement. The funding was provided by the DRILL (Disability Research on Independent Living and Learning) programme, a £5m scheme led by disabled people and funded by the Big Lottery Fund. The report includes accounts from disabled parents, including those with mental health problems. It shows that health and social care professionals are not following government guidelines around family assessments and eligibility for social care support. One parent told researchers: “You don’t want to call social services, you are scared to call them because they might think you are incapable of looking after the child, so you have to struggle with what you have… because then they will say, ‘we told you she’s disabled, she can’t look after her child’, so there’s always that element of fear, of ‘shall I or shall I not?”. The report concludes that children are largely invisible to adult social care and health professionals. One parent with mental health problems said that when she was sectioned she was asked if she had any pets that required care but not about her children. Social care professionals planning post-discharge support for a mother of two children who had broken her back decided she should receive meals on wheels – but that food would not be provided for her children. Sue Bott from Disability Rights UK said: “This research gives a much-needed voice to disabled parents. Now professionals and policymakers need to listen to them. While we recognise the complex demands facing health and social care professionals, they should work with each other and with disabled parents to provide the support that keeps families together”. would like to hear about the products you’ve found useful to make daily life easier. And what about the ones that don’t help? and read reviews about small- to medium-sized products that can help with leading an independent life. who are better informed about their choices when buying and using goods. the Leicestershire Centre for Integrated Living, and Enabled by Design. the world’s first major research programme led by disabled people. PS: Every month Rate it! is giving away a prize. Every review written at bit.ly/RateitSignUp will count as a single entry. For September, the prize is an Amazon Alexa. As it’s the start of the school and college year, what about reviewing products that make studying easier? good design can support people to live independently by helping to make life that little bit easier. I was delighted to be asked to chair the Advisory Group for the Match Me research project. It has been a real pleasure to meet both the research group from Stirling University and the other members of the group who have come from a variety of backgrounds. Our first meeting was spent getting to know one another and was a very positive start to the programme. Our most recent meeting involved hearing more about the extensive work of the research team, and Dianne and Julia [Project researchers] did a very thorough job of taking us through the work to date. It was also an opportunity for us to hear about the work of the peer researchers which was very effectively outlined by Glen. I am looking forward to hearing about the next stage of the work over the next few months and to meeting up again later in the year. My interest lay in the provision for and access to housing disabled people. My experience lay in my association with a local Aberdeen group that helps match disabled people to housing in the city. Up until 5 years ago, housing was never an issue for me and my family. However, our circumstances changed significantly at that time and we suddenly found that we needed adapted, accessible housing. It hasn’t been easy trying to get this and I’ve been very grateful to have the support of the charity Housing Options and housing association Horizon. I was therefore delighted to be asked by Housing Options to join the steering group for the Match Me project as my own experience had led to a wider interest in access to adapted social housing. The meetings and discussion with the project team have been extremely interesting covering everything from the practicalities of engaging with those involved through to research ethics. I’ve been able to use some of my own experiences to contribute to discussions and learnt a lot from others involved. I’m looking forward to the final report and recommendations as I know from the interim findings that although there is some good practice there are also still far too many disabled people not able to access suitably adapted housing. The DRILL Programme is now advertising two Tender Opportunities. Please click on the links below, which will take you directly to the Tender page where you will find all of the details required. The DRILL Programme is in its fourth year, we are now commissioning to fill specific gaps that have been identified. 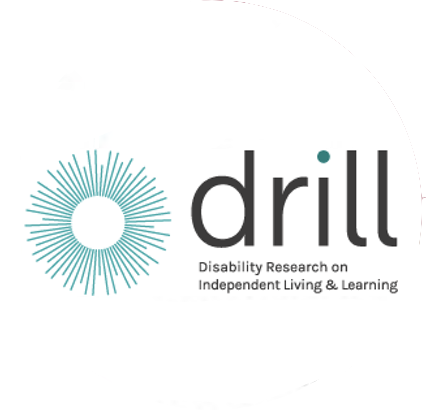 DRILL’s aim is to enable disabled people to achieve independent living and inform future policy and service provision, as well as give a greater voice to disabled people in decisions which affect them. We welcome Tenders with a strong emphasis on co-production. The Contract period for each will be 12 months with a maximum contract value of £100,000 (inclusive of VAT). The deadline for Tender submissions is the 27th November 2018 at 12 noon. Please have a look and contribute towards the legacy of the DRILL Programme. #DrillUk cover art made by me.